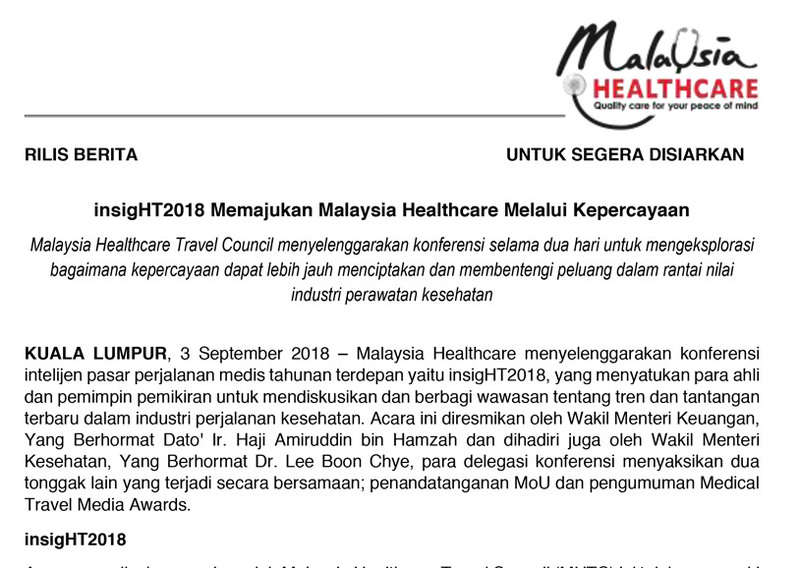 KUALA LUMPUR: The Malaysia Healthcare Travel Council (MHTC) is targeting RM1.3 billion revenue from medical tourism this year. MHTC CEO Sherene Azli said about 900,000 medical tourists contributed more than RM1 billion in revenue last year. “This year we are looking at one million medical tourists with about 30% growth in revenue,” she told reporters at the announcement of the 2017 theme “Share My Love” for the Malaysia Loves You campaign. In order to achieve this target, MHTC will promote targeted services to Indonesia, China, Vietnam, Myanmar and India. Sherene said the majority of medical tourists seeking treatment in Malaysia are from Indonesia, who contribute 70% to revenue. The top five treatments that medical tourists seek in Malaysia are cardiology, oncology, orthopaedic, IVF and blood-related treatments.